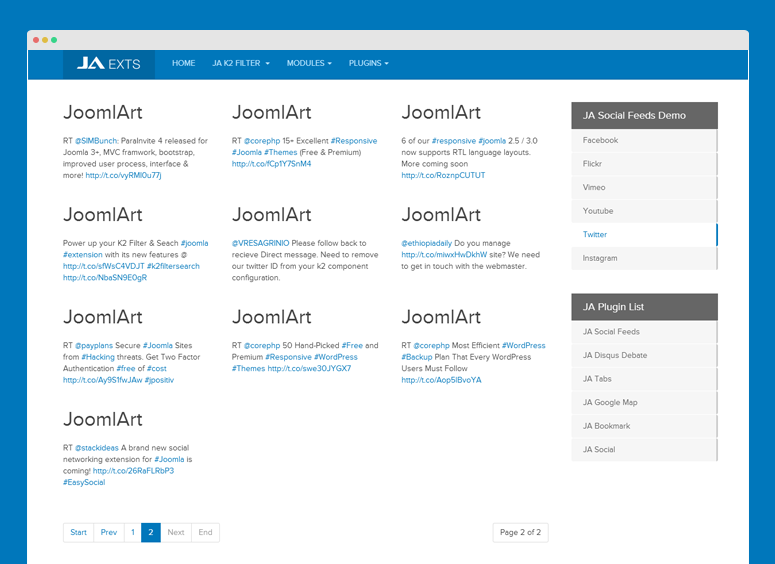 If you are new to Joomla, you can check our detail guide of how to install extensions in your Joomla site. 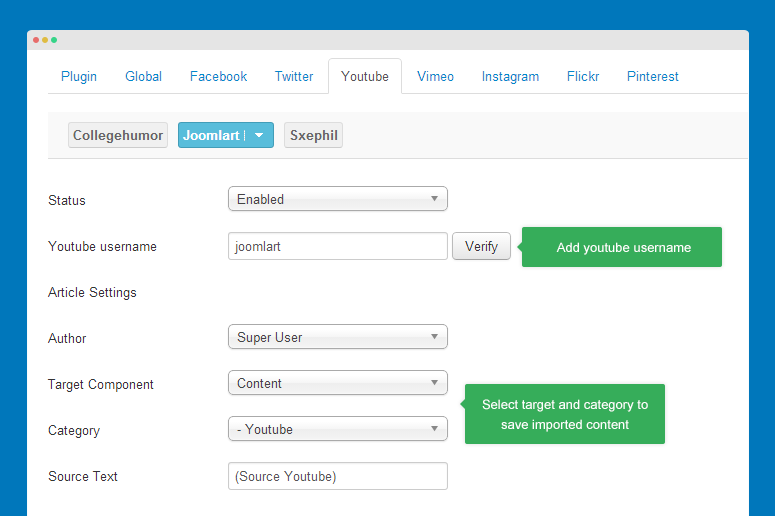 The plugin allows you to import content automatically from popular social channels: Facebook, Twitter, Youtube, Vimeo, Instagram Flickr and Pinterest then save the content as Joomla articles or K2 articles. To import content, you have to follow the steps below. 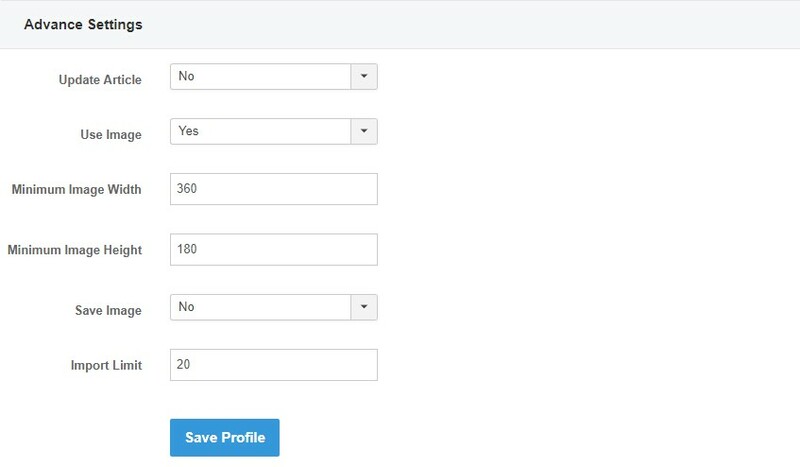 Once you install the plugin, you will see numbers of profiles in each supported social channel, these profiles settings are valid so you can use the profiles to import content to your site. 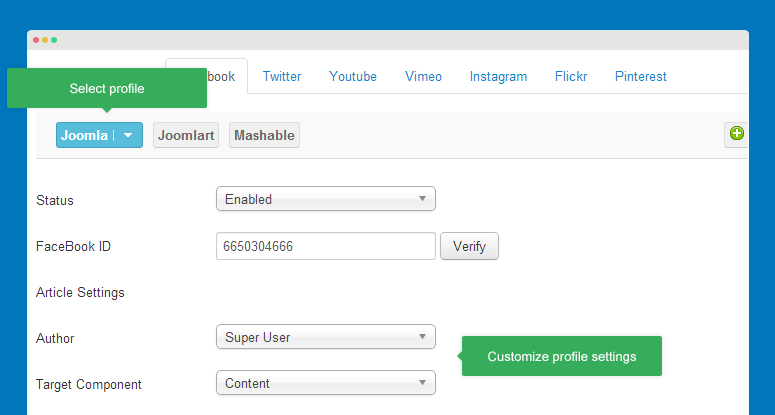 Open any profile, then customize its settings. You can save the imported content as Joomla articles or K2 articles to selected category. You can select to save images to your site hosting. 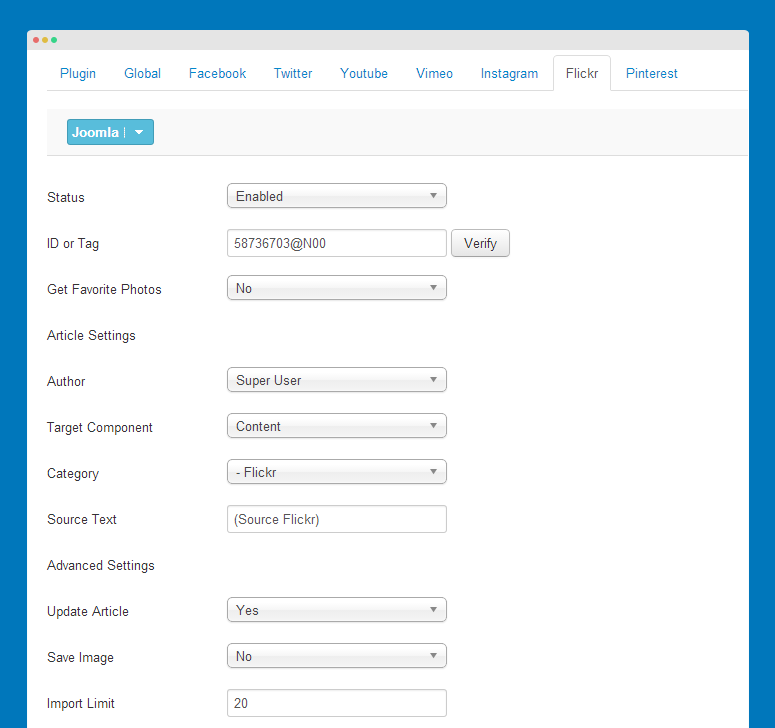 In profile setting of each social channel, you will see field Save image under Advanced settings, enable this option so when you import content, images will be saved to your site hosting. The images are located in images/jasocial_feed. Note: after you work with a profile, you have to save the profile. The saving button for the plugin (on top right corner) is not applied for saving the profile. Your work with the profile will be lost if you use the saving button of plugin. 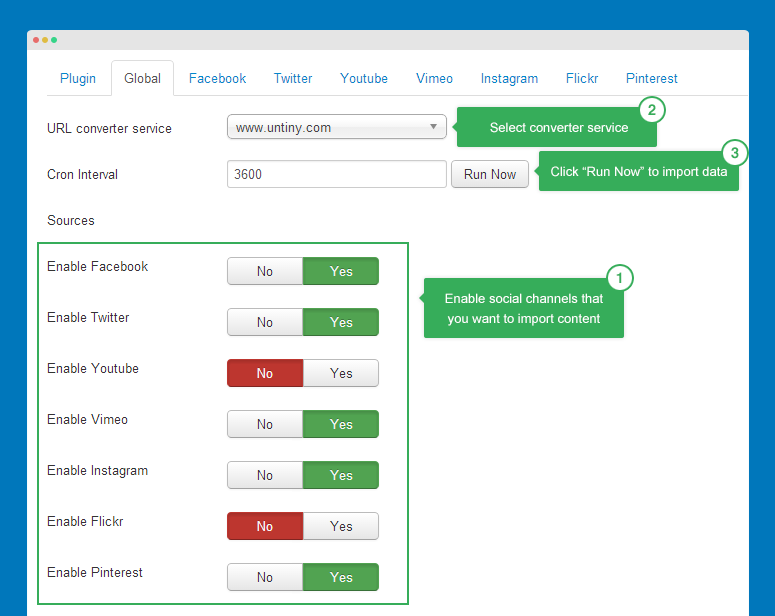 Enable the social channels that you want to import content from. 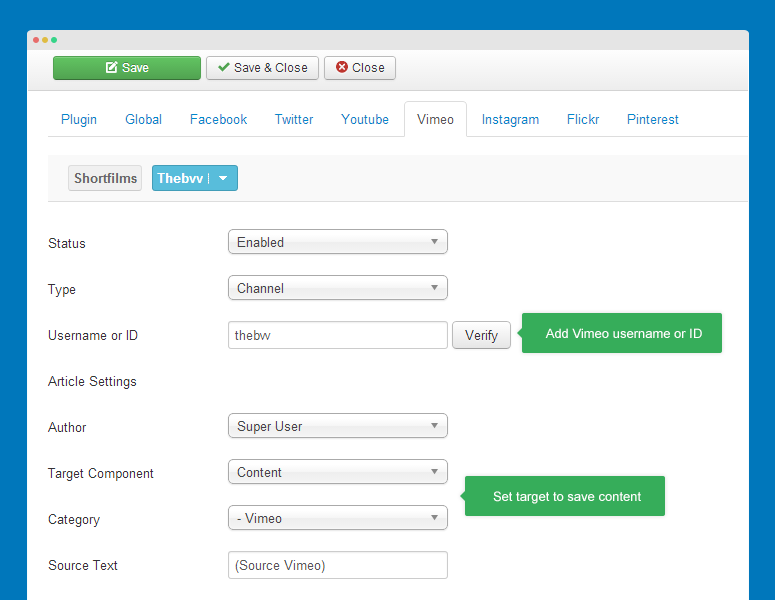 In each enabled social channel, it will import content from enabled profiles only. URL converter services: select service to import content (http://untiny.com/ or http://realurl.org/). Cron Interval: set the duration to import content AUTOMATICALLY from enabled social channels, click "Run Now" to import content immediately. 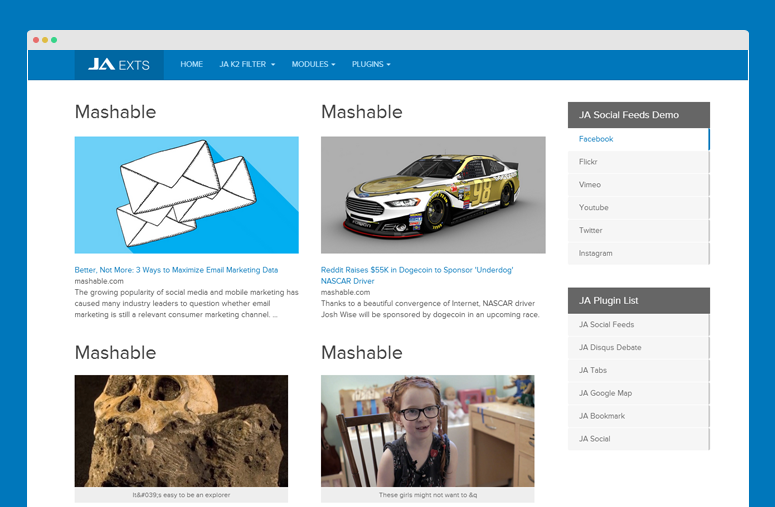 When you have content stored in your site, you can now display them in your site. The way you display them is up to you. 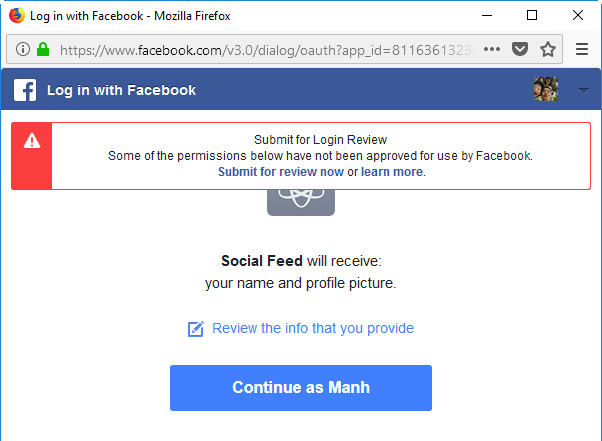 Your site must support https as a request of Facebook to get the data. 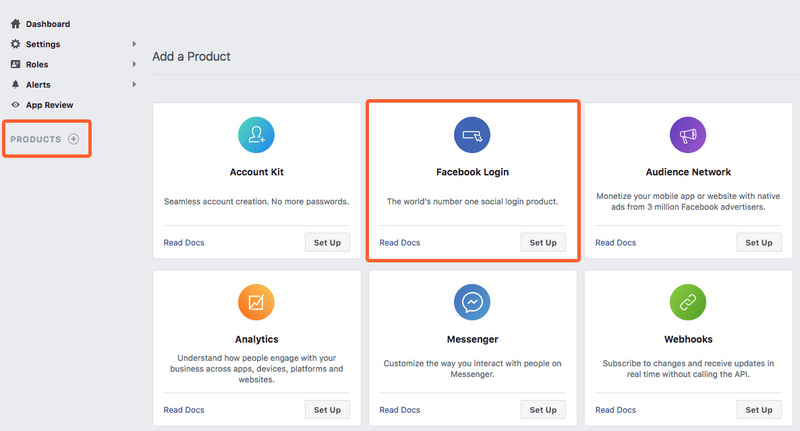 Account Login to Facebook must be Admin of the Page you want to get the data. The Facebook profile must be verified at the first time Cron. Facebook profile use Facebook fan page ID, Fanpage Name no longer supported. 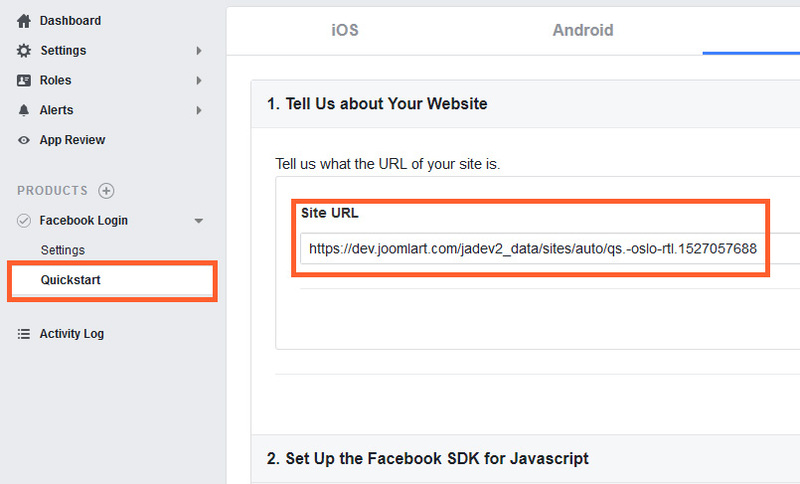 Facebook updated Graph API 3.0. 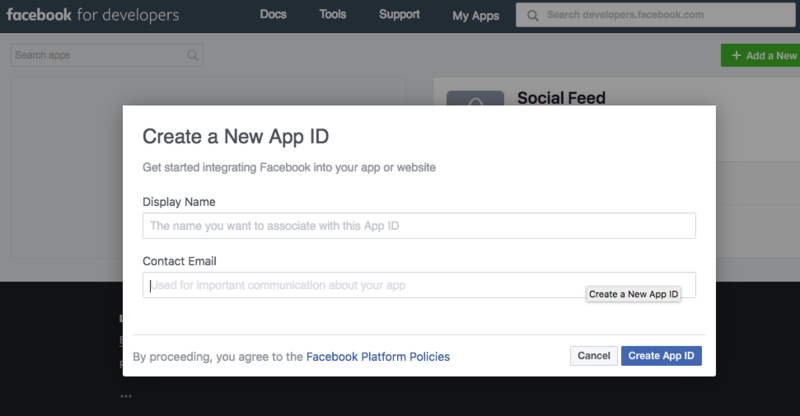 Step 1 - Go to the Facebook Developers Apps page, and sign in with your Facebook username and password then go to My Apps > Add New App. Step 2 - Enter a name for the application in the "App Name" field. Step 3 - In Left menu section, access Settings >> Basic, enter the info and save the settings. Add product Login: click the plus icon to add New Product and choose Facebook Login then set it up. Then add your site URL: Save and Click Next. 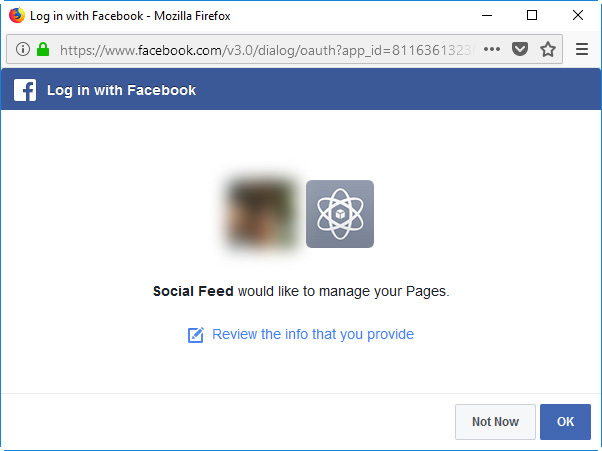 Back to JA Social Feed plugin setting on your site: Extensions > Plugins > JA Social Feed Plugin and paste the ID you get to Facebook Settings fields. On the Facebook profile, enter Facebook fan page ID (must be ID), and change the setting as you want then save the settings. Verify Fanpage ID by click to verify button. Next step: Click to Login with Facebook to get the account set with plugin. 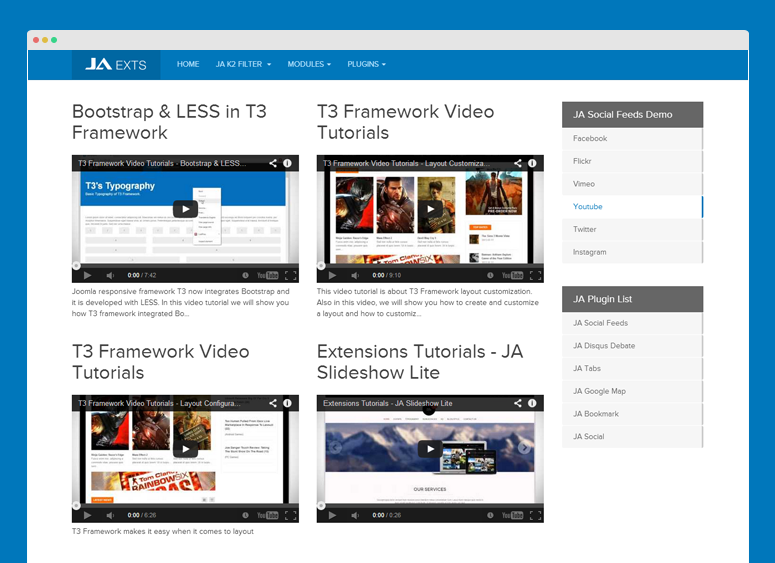 Target Component: you can save the imported content as Joomla article for K2 articles. Incase you want to save as K2 articles, your site must have K2 installed. Title Type: you can set the title for articles imported by Author name or custom text. When you select Custom Text, add the text that will be article title imported from the profile. Let's check imported content in our site. 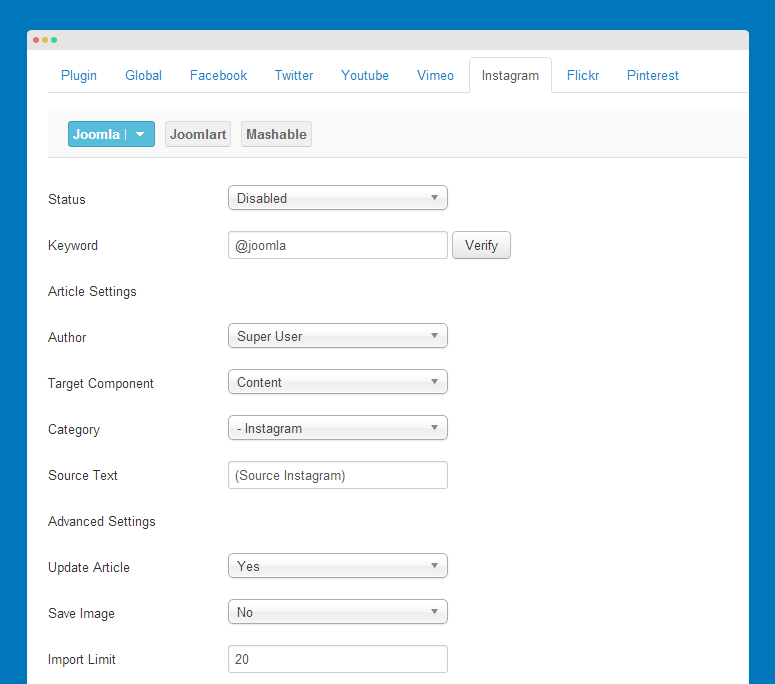 Update Article: if Yes, when content from source is changed, it will be updated to your site when you import content. Use Image: if Yes, the plugin will automatically extract image from the URL that user shares then add it into article for displaying. If No, it will import text only. Save Image: you can select to saved the qualified image to your site hosting. 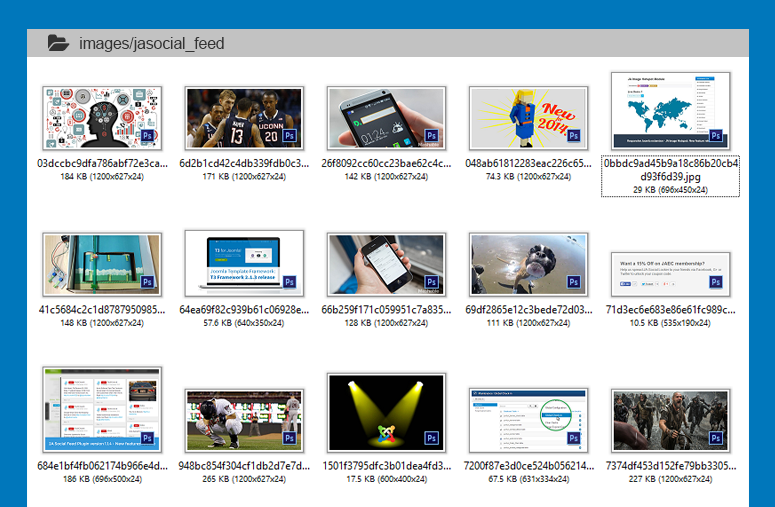 The images will saved in folder: images/jasocial_feed. Import Limit: set the maximum items to be imported from the profile each time you import content. In API v1.1, Twitter deny non-Authorized request, that means you need to provide the information below to authorize your request. 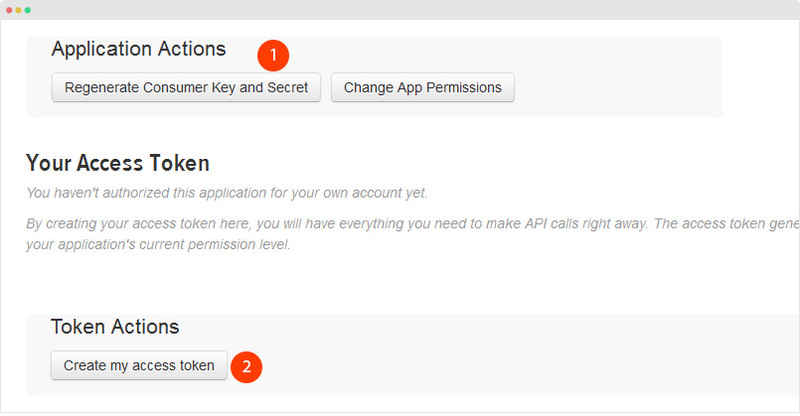 To get content from Twitter, we need to get OAuth information. The OAuth includes: Consumer key, Consumer secret, Access token, Access token secret. #1: Login the site: https://developer.twitter.com/apps/with your twitter account, if you do not have a twitter account yet, please register one. When application is created successfully, open the Keys and Access Tokens tab and hit the buttons: Regenerate Consumer Key and Secret to generate consumer key then hit the button: Create my access token to create access token. 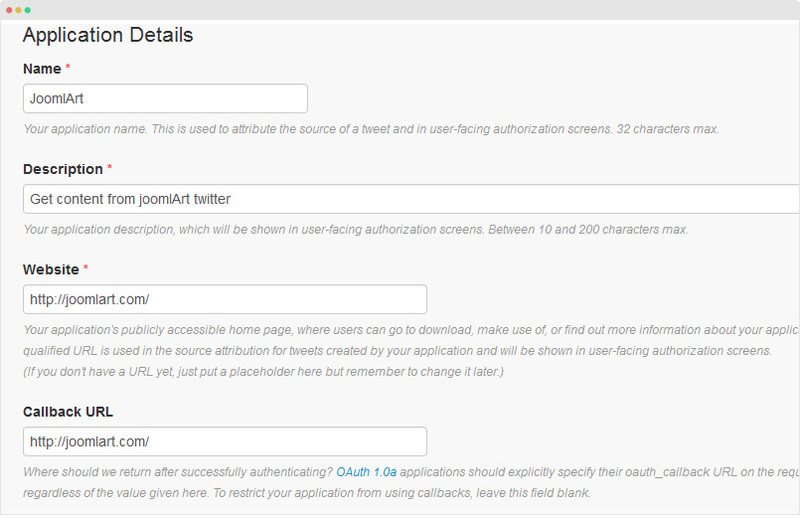 After access token is created, copy the info to add to the Twitter: OAuth settings setting panel under the Global tab of JA Social feed plugin setting. Twitter introduced tweets timeline option that allow to get a list of tweets for aggregated stream of Tweets. To use this option you musth change the name of API Endpoint. JA Social feed extension support standard search API it allows simple queries against the indices of recent or popular Tweets. Here is list of Twitter search API. Enter the youtube username that you want to import content from. Other settings are the same as settings in Facebook profile settings. Width | Height: set the size of the video to be saved in an article for displaying. Show Suggested Videos: if Yes, the suggested videos will be displayed when the video finishes. Use HTTPS: the secure counterpart to HTTP, wraps a layer of encryption around the information traveling between your computer and a web server.T his is typically used to provide enhanced privacy and security for services like web browsing, email and instant messaging. Many sites that offer HTTPS support including content from other sites. When some parts of the site do not access using HTTPS, browsers generate a "mixed content" warning since not all items on this page are secure. Sites that use HTTPS and add default Youtube video embeds could generate this warning. To avoid that, and to allow your site to support HTTPS more consistently, you can choose the new Use HTTPS embed option. It is important to note that while embed components are all supported using HTTPS and do not generate the mixed content error, we do not yet support video streams over HTTPS. We've been working to give our users more options and control over these cookies. One such option is the privacy-enhanced mode for our embed player. This mode restricts YouTube's ability to set cookies for a user who views a web page that contains a privacy-enhanced YouTube embed video player, but does not click on the video to begin playback. YouTube may still set cookies on the user's computer once the visitor clicks on the YouTube video player, but YouTube will not store personally-identifiable cookie information for playbacks of embedded videos using the privacy-enhanced mode. 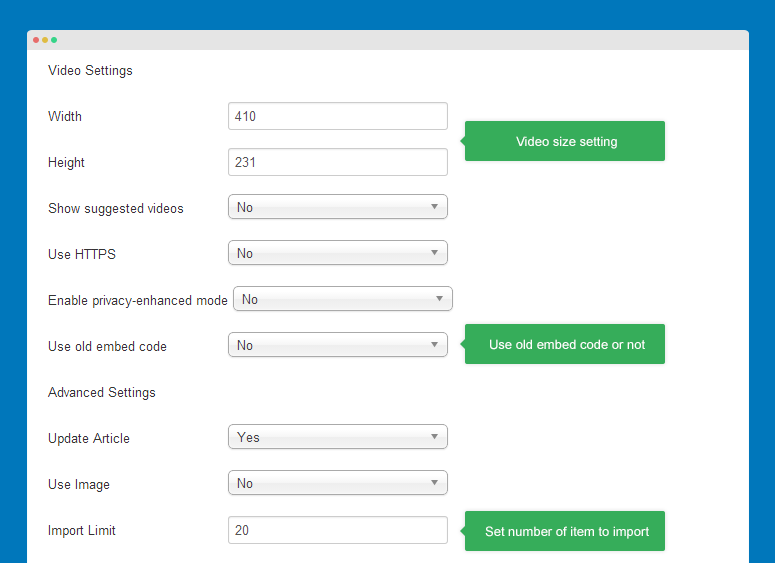 Use old embed code:There are two styles of embed codes that are available for YouTube videos. The new embed code begins with "_QQ_"<iframe..."_QQ_" and supports both Flash and HTML5 video. The older style of embed code begins with "_QQ_"<object..."_QQ_" and only support Flash playback. Some services only support the older "_QQ_"<object..."_QQ_" embeds. If you do encounter a site that rejects your "_QQ_"<iframe..."_QQ_" embed code, the recommended course of action is that you use the older "_QQ_"<object..."_QQ_" code for the time being. 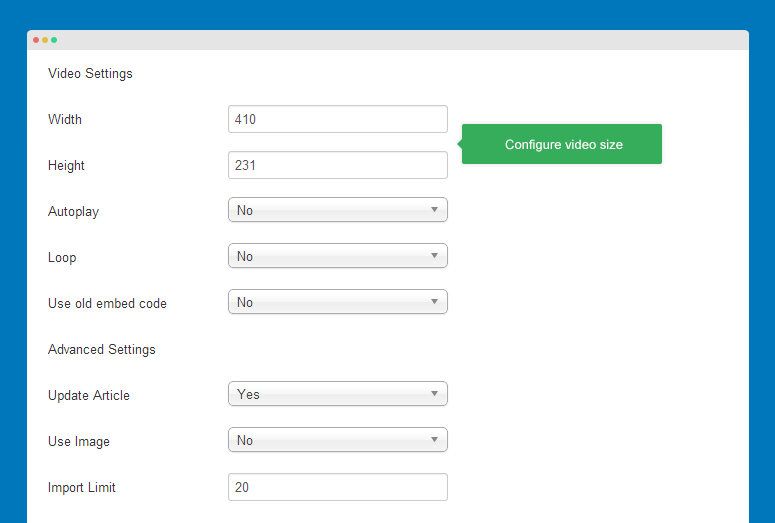 Username or ID: add the correct Vimeo Username or ID to import content from. 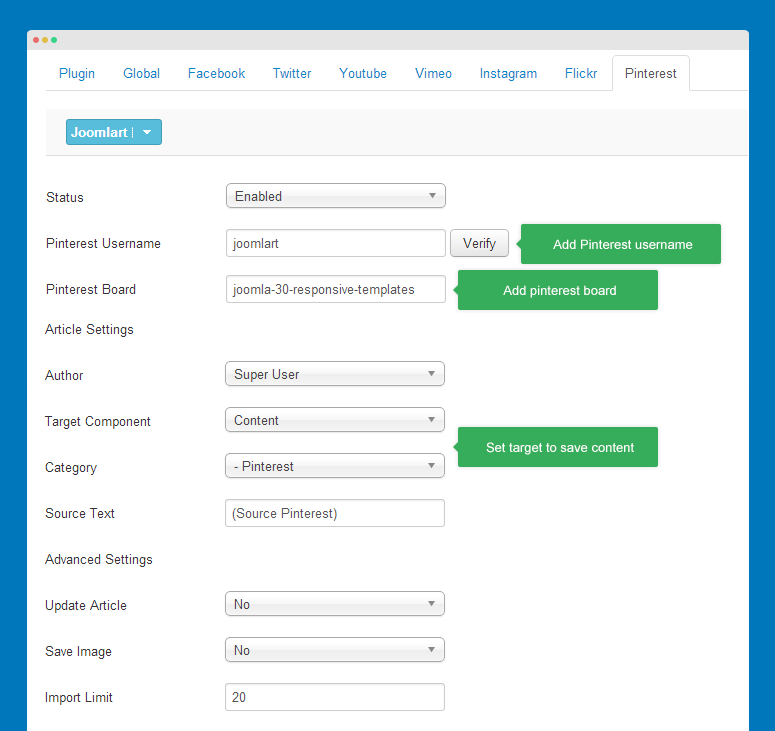 Target Component: select to save imported content as Joomla articles or K2 articles. Category: select category where imported content will be saved to. Width | Height: set the size of video to be saved in article for displaying. Show Suggested Videos: if Yes, the suggested videos will be display when the video finishes. Auto play: select Yes if you want video to auto play when user open article contain the video in front-page. Loop: loop video or not. 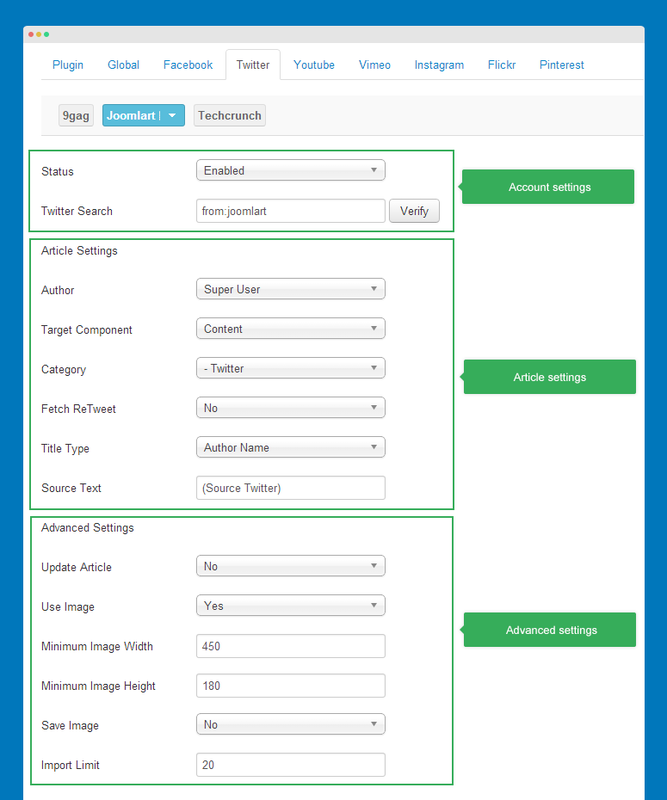 In the advanced setting pannel, you can select to use image in imported content or not, update article and set limitation for number of items to be imported. On Wednesday, 1st of June, 2016, Instagram’s platform changes goes into effect for apps created before November 17, 2015. These changes include a more focused set of terms, a new permissions review process, and the deprecation of the /users/self/feed and /media/popular API endpoints. 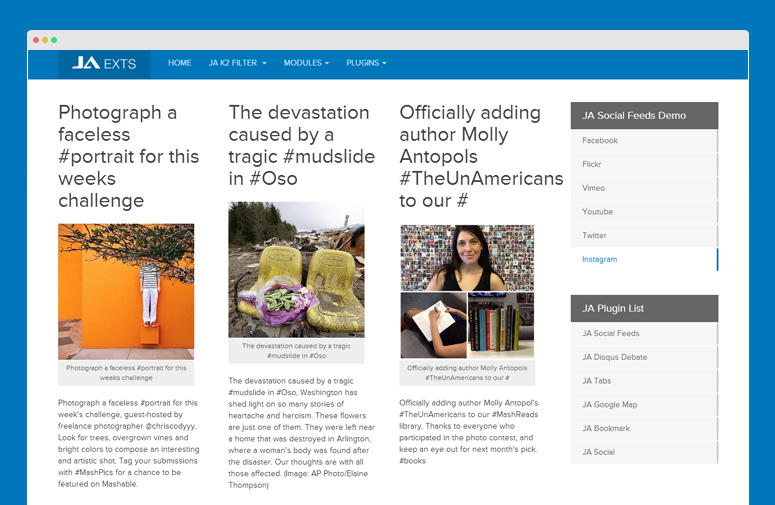 Due to the changes, we also updated JA Social feed plugin. If you want to get post from ‘tag’, you will need an Application which is reviewed and approved from Instagram. Requirement: Don’t need Application info. Requirement: Need Application which is reviewed and approved by Instagram. Valid redirect URIs: must be the site path has JA Social Feed installed. Once done, click on: Edit Client Info >> Permission tab >> click "Start a Submission". It will take at least one week to get review done. Client Info will appear after step 3. Add all the info to JA Social Feed. 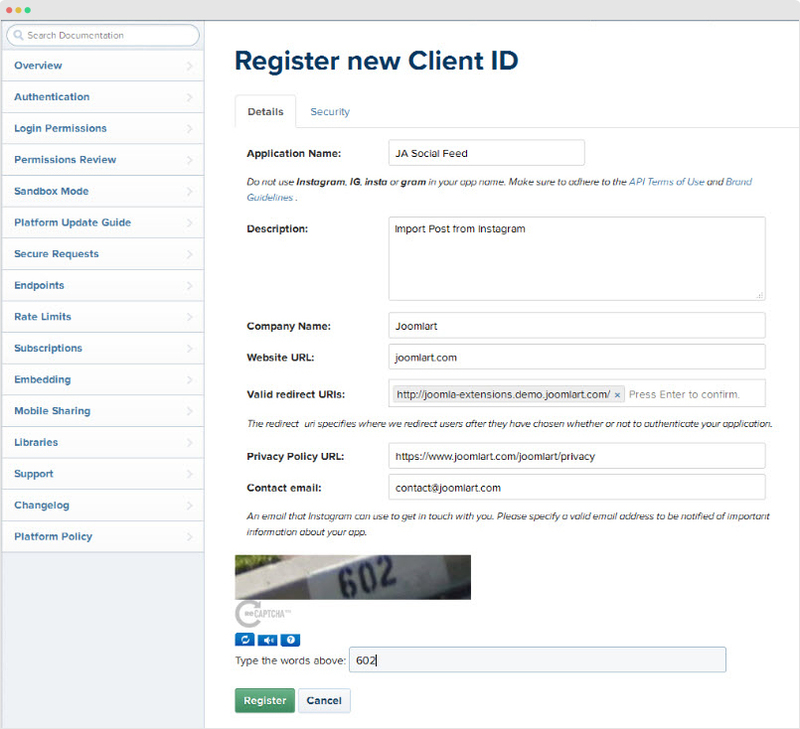 Add Client ID, Client Secret, Redirect URI to the Text field then save the settings. Once done, hit the "Edit" button to get Access token key. If all the info is correct, access token key will be generated. Copy & paste the info to Access token field in the JA Social Feed configuration. Now you’re ready to Import post from Instagram. If your Application in Sandbox Mode, you can only get post with Tag from your own account. Your access_token isn’t valid forever, If the token is no longer valid, API responses will contain an “error_type=OAuthAccessTokenError”. In this case, please hit ‘Get Access token key’ button to get new Token key. Pinterest board: add the pinterest board that you want to import content from. Leave it blank if you want import LATEST PINS. 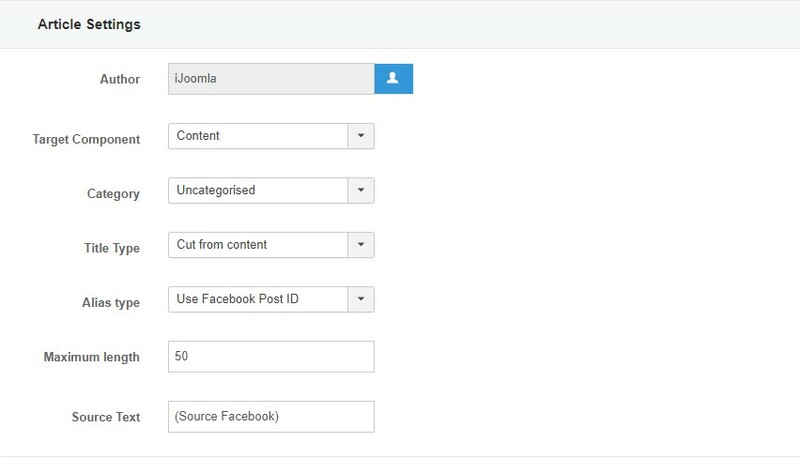 JA Social Feed Plugin allows you to import data automatically from RSS feeds channels. 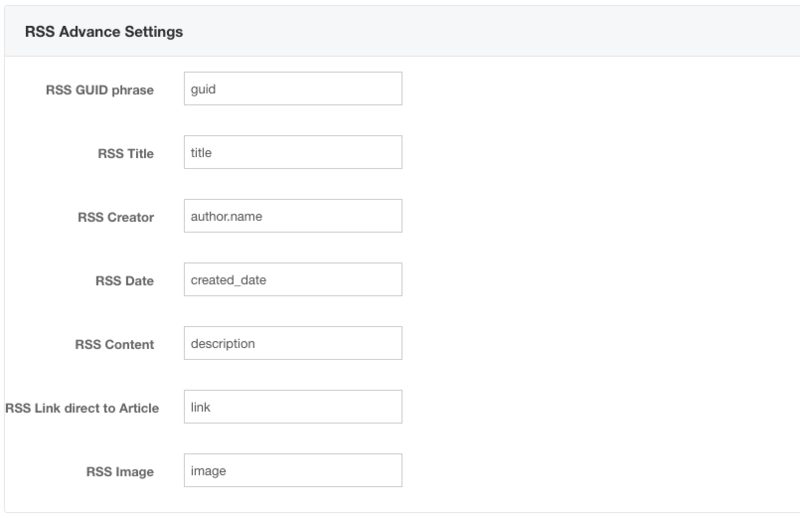 In the plugin configuration page, open the tab "RSS", create profile, add RSS feed link to get data from. 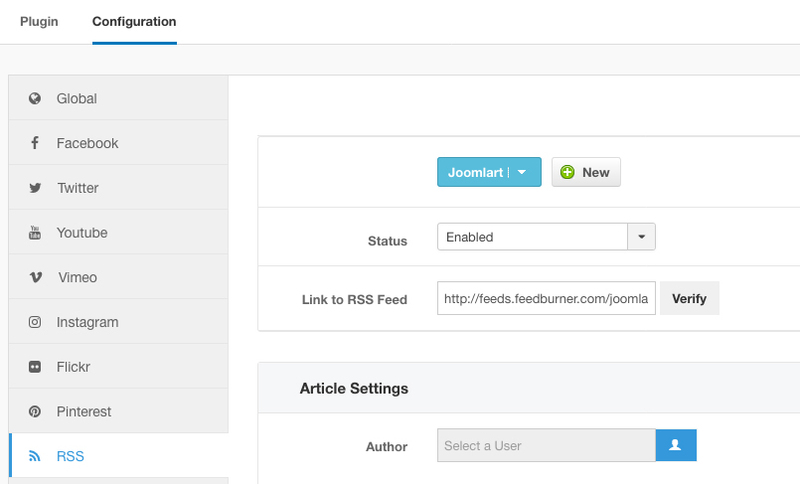 The imported data from RSS feed page will be saved as Joomla articles or K2 items. You can assign author for imported articles, intro image, category to store article and source text. This is new feature in version 1.3.3 to help you get RSS feed from different pages that could have different markup, item tag name. 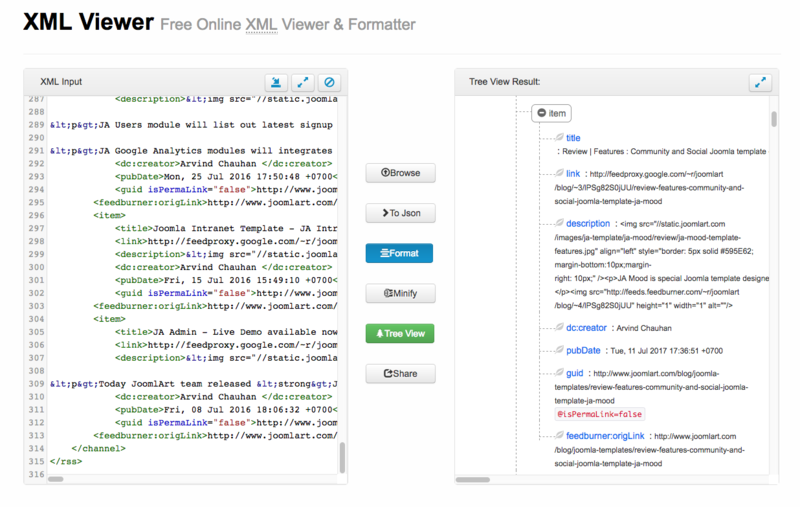 #2: View source of the page: view-source:http://feeds.feedburner.com/joomlart/blog and copy the souce code. 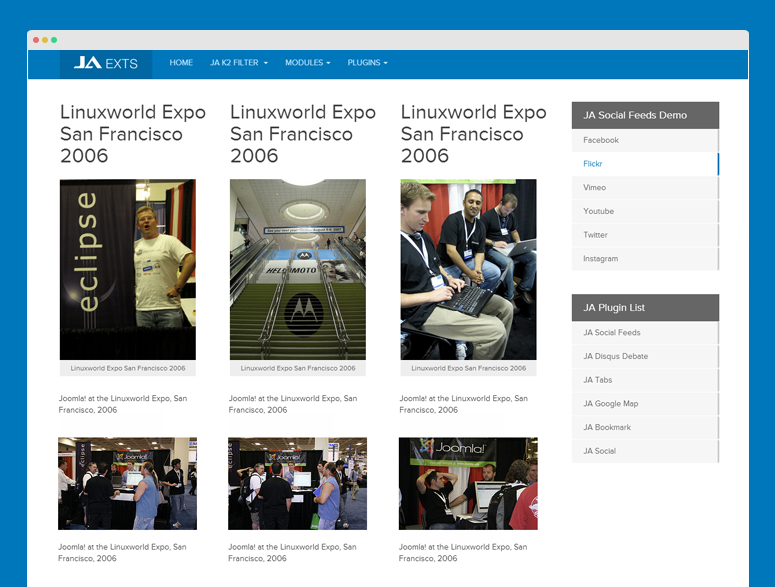 #3:Open http://www.xmlviewer.org/, paste the source code here and check the Tree View. Now, for each item, you will see list of content type and the tag title: title, link, description, dc:creator, pubDate, guid, eedburner:origLink. Those elelements can be different from other RSS feed page. 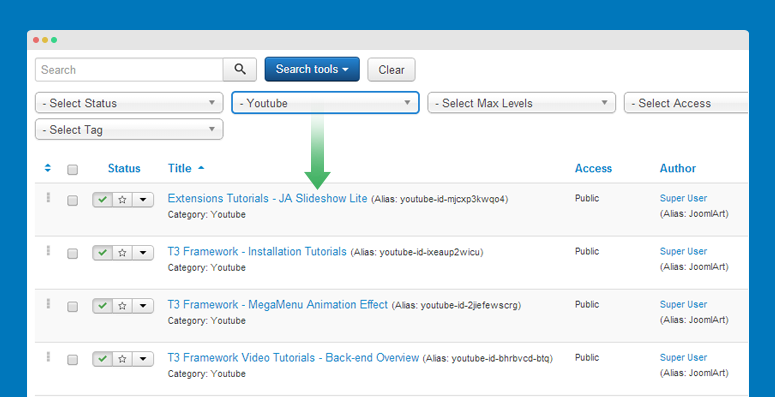 Update the tag title for corresponding field in the JA Social Feed - RSS Advance Settings panel. Update Article: Enable this option if you want imported articles can get updated content if the source content is updated. Articles will be updated when you import again. Save Image: Enable this option so images will be saved to your site folder instead of loading it from source. Import Limit: set maximum number of posts to be imported each time. 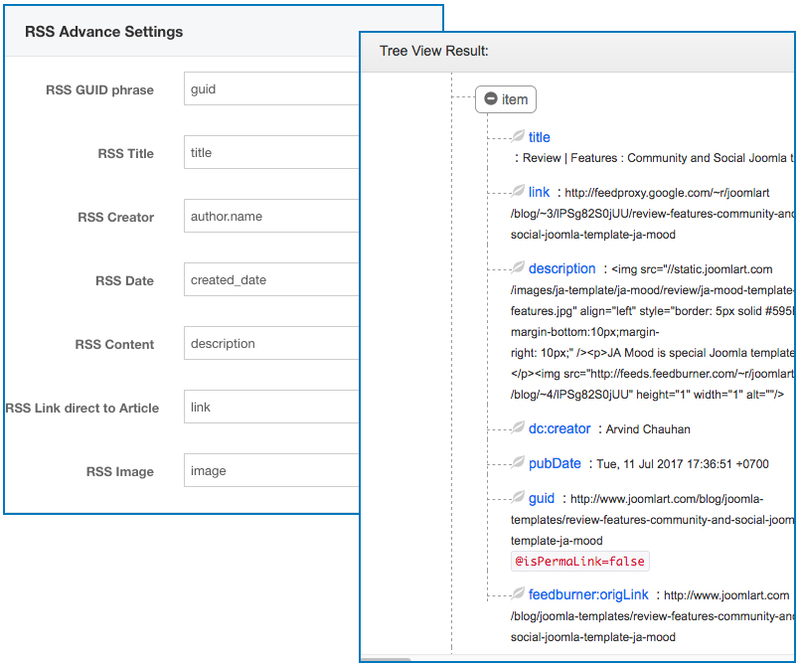 JA Social Feed Plugin support Crawler, that allow you to fetch the article content from list articles in RSS feed or from an HTML page. 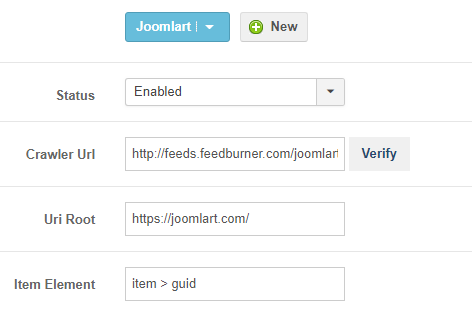 If you have a list of articles/posts on RSS feed and you would like to import them on your Joomla articles this option is the best choice. An Identity code is required to fetch the data from list of feeds. It has 3 parts: [selector], [type], [attribute]. Each part will be separated by vertical bar ( | ). [selector] : is css selector. Ex: #content, .kcn-content. 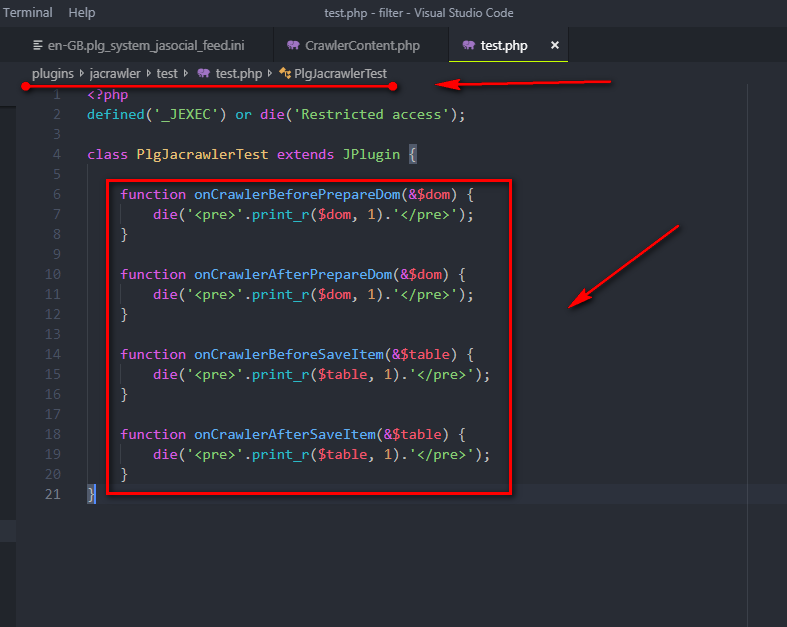 Crawler can find elements by using this. [type]: support 3 types: [text], [attr], [html], [outerhtml]. If the [type] is empty, Crawler will see it as [text]. This helps Crawler know which value type do you want to get from elements. [attribute] with [name] is attribute name, [value] is attribute value. Lets take some example . Crawler Url: Put the url you want to scan articles. Support rss, html. Uri Root: Root url of the site that you fetch content from. Now Click to Verify button to know which links Crawler’s gonna get content. Please note In Verify page, it will show the demo result of one article. Note: better to check those links works or not. If not work, check the “Item Element” config. Now you got a collection of article links. This section will only apply for content fetched from those links. (i) From HTML: add HTML markup code like Identify Code part where title is stored. Leave blank: get time added article to system Time added. Custom: user load custom image. Leave blank or get wrong HTML Markup: No image is inserted. Elements to Remove: add HTML markup code like Identify Code part where element need to be removed, is stored Each Element in one line. There are 5 special settings: Elements to Remove, Classes to Remove, Attributes to Remove, Classes, to Add, Attributes to Add. Those settings are using textarea, in order to define multiple elements. Each line is an element. For some reason, all the settings are not enough for you. You may need some extra works on data. 1. You can create a plugin in the group “jacrawler” and use Crawler events. 2. Crawler provides some events that help you handle the data manually. 3. onCrawlerBeforePrepareDom: trigger before prepare dom for each item. 4. onCrawlerAfterPrepareDom: trigger after prepare dom for each item. 5. onCrawlerBeforeSaveItem: trigger before store item on database. 6. onCrawlerBeforeSaveItem: trigger after store item on database. 7. onCrawlerBeforeSaveItem: trigger after store item on database.